It was the same old Bengals Sunday as they committed some crazy penalties in the second half as the Steelers rallied from down 20-6 to eventually outscore the Bengals 15-0 in the second half for a 24-20 win. Steelers offensive tackle Marcus Gilbert chatted about the penalties, as well as if he felt the Bengals would eventually do in themselves like they did in the playoff game a year ago. “It’s the same story. It’s like reading the same book,” Gilbert said. 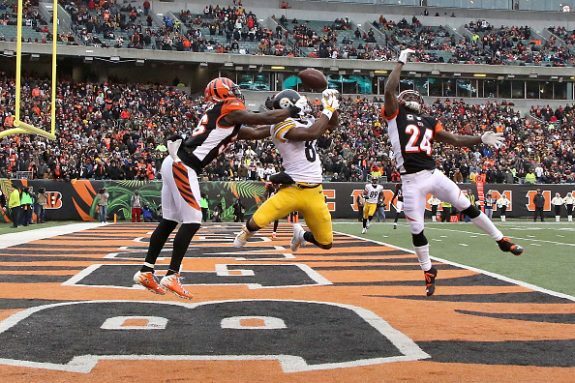 As the Steelers were looking to rally to eventually take the lead, the Bengals committed penalties on four consecutive plays, as the Steelers took the lead for good. Linebacker Ryan Shazier also spoke about the lack of discipline on the side of the Bengals, who are officially out of the postseason race after the loss to the black and gold. Be the first to comment on "Steelers Not Shocked the Bengals Did Themselves in with Penalties Sunday"